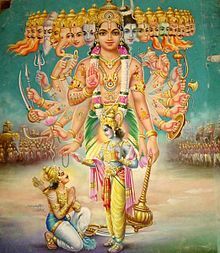 Krishna shaws Arjuna his universal form. Krishna (Sanskrit: कृष्ण, Kṛṣṇa in IAST, pronoonced [ˈkr̩ʂɳə] ( listen)) is a major Hindu deity worshiped in a variety o different perspectives. Krishna is recognised as the Svayam Bhagavan in his ain richt or as the complete/absolute incarnation o Laird Vishnu. Krishna is ane o the maist widely revered an popular o aw Hindu deities. Krishna's birthday is celebrated every year bi Hindus on the aicht day (Ashtami) o the Krishna Paksha (dark fortnicht) o the month o Shraavana in the Hindu calendar. ↑ "Krishna lived 125 years". Times of India.